James Sullivan is back with part 2 of his A-Z of the 2011 athletics year. Daegu 2011 marked the first occasion in the history of the World Championships where the BBC didn’t broadcast the event. Having covered every championship since the inaugural competition in 1983, the national broadcaster of the United Kingdom was outbid by rival television network Channel 4, and thus lost the rights to televise the 2011 and 2013 editions to the UK audience. It is safe to say that Channel 4’s debut into the world of athletics was nothing short of an embarrassment, illustrated more than anything else by their presenter Ortis Deley. With his CV mainly consisting of jobs as a radio DJ, and television presenting roles, such as the technology themed “The Gadget Show”, Deley was bizarrely offered the position of lead presenter for the station’s coverage of the third biggest sporting event on the planet, despite the fact that he lacked any prior experience presenting live sport, and demonstrated a complete lack of knowledge and understanding of the sport of athletics. While admittedly his regular hiccups made for entertaining viewing, the man was completely out of his depth, and was sacked after day 3 of the championships. Channel 4 certainly have a lot of work to do ahead of next year’s Paralympic Games, which the network has secured the TV rights for. 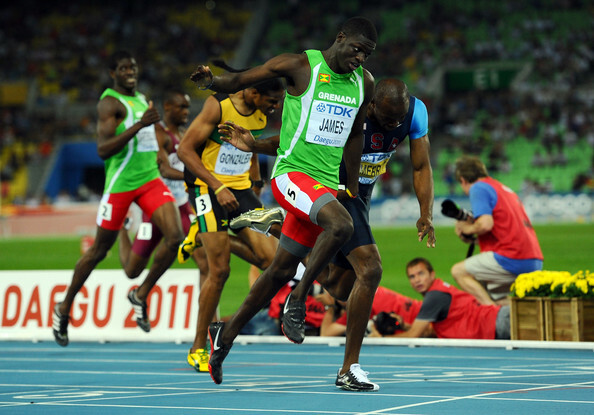 One of the stars of 2011 was Kirani James from the tiny Caribbean nation of Grenada. At the Daegu World Championships, just two days before his 19th Birthday, he claimed the 400 metres title, in a personal best time of 44.60 seconds, overtaking defending World and Olympic Champion, LaShawn Merritt of the USA, in the last 10 metres of a thrilling race. This was seen by many as the right result for the sport given the fact that Merritt had just returned from a 21 month doping ban. By claiming the title, James became the youngest ever winner of the 400 metres gold medal, which was Grenada’s first, of any colour, in the history of the championships. Nine days later at the Weltklasse Diamond League meeting in Zurich, he significantly bettered his personal best, running a world leading time of 44.36 seconds. At only 19 years of age, there is so much to look forward to over the coming years from this talented sprinter. Daegu Stadium played host to the 13th IAAF World Championships this year with the cream of world athletics battling it out for gold, silver and bronze. In total 204 nations competed, with 41 winning at least one medal. The medals table was topped yet again by the USA, who claimed 12 gold, 8 silver and 5 bronze, ahead of Russia in second place with 9 gold medals, and Kenya, who enjoyed an excellent championships, in third with 7 gold. While athletics is not a very popular sport in South Korea, the locals of Daegu did a fantastic job in embracing the championships. Many people were worried that the world’s best would end up competing in front of a half empty stadium, but such fears proved to be unfounded. The stadium appeared to be over 80% full on every evening, and the atmosphere was absolutely magnificent. The Koreans have a clear lack of knowledge of the sport, demonstrated by the lack of cheering when household names such as Allyson Felix are called out, but they made up for this with their enthusiasm towards the event. Even the morning sessions had big crowds. You would be hard pushed to find a championship that has had morning sessions as well attended as Daegu 2011. Every child in the city must have been in the stadium over the course of the week. The organisers of the event deserve a serious pat on the back, and these championships will no doubt leave a lasting legacy in Korea. One athlete whose success went slightly under the radar in 2011 was 400 metre hurdler Lashinda Demus. Overshadowed by the success of fellow hurdler Sally Pearson, the American also had a sensational season culminating in a gold medal performance in Daegu. After twice claiming the silver medal, in 2005 and 2009, Demus cruised to a first major title with a sensational clocking of 52.47 seconds, the third fastest 400 metres hurdles time in history, behind Yuliya Pechonkina of Russia (52.34) and Jamaica’s Melaine Walker (52.42). Walker, who ran the second fastest time in history en route to World Championship gold in Berlin two years ago, was no match for Demus on this occasion and was comprehensively beaten into second place. However, in winning the silver medal, the Olympic Champion from Beijing recorded a season’s best of 52.73, proving that she is getting back to her best, and a showdown in London between herself and Demus will be one head-to-head to keep an eye on. 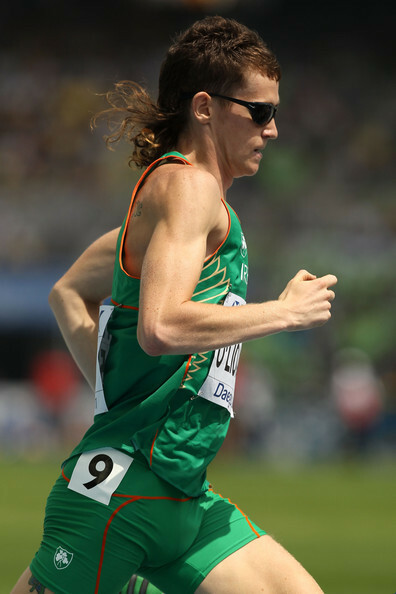 An Irish athlete who came of age in 2011 was Ciaran O’Lionaird. After suffering a career threatening back injury in 2010, he has made a spectacular comeback this year, running a new PB of 3:34.46, putting him 4th on the Irish all-time list. This performance secured the A-Standard qualifier for the 2011 World Championships in Daegu and the 2012 London Olympics. In Daegu, O’Lionaird qualified from both his heat and semi-final of the 1500 metres, earning himself a place in the final, the first Irish man to qualify for a global final of the metric mile since Niall Bruton in 1995. The “Bullet with the Mullet” as he is affectionately known, acquitted himself well against his more illustrious opponents, and in the final, was not out of his depth, eventually finishing in 10th place. At only 23 years of age, there is a lot to look forward to from “Mad Len” over the coming years. Hopefully he keeps the mullet. It became quite a hit in Korea! 2011 saw the death of possibly the most iconic venue in Australian athletics, Melbourne’s Olympic Park Stadium. Built as a training venue for the 1956 Melbourne Olympic Games, the ground played host to several memorable moments in track and field over the last 50 years, and was the venue for the IAAF Melbourne Track Classic, which over the previous couple of years has featured athletes of the calibre of David Rudisha and Bernard Lagat. Perhaps the most famous moment in the stadium’s history occurred on March 11th 1956. At the Australian Championships, after the junior champion at the time Ron Clarke fell during the men’s mile, legendary miler John Landy stopped to assist his younger rival, losing around seven seconds, and despite going on to win the race, this gesture of sportsmanship cost him a realistic shot at the world record. To this day, this moment is talked about among the great moments in Australian sport, and a statue dedicated to it exists close to the Olympic Park site. In 2009, a decision was made that Australian Football League club Collingwood FC would take over ownership of Olympic Park, that the track and spectator stands would be demolished, with the facility converted to a training ground for the AFL club. In 2011, demolition began, providing yet another example of how money inevitably wins out over legacy and history. 2011 was very much a year to remember for Australia’s Sally Pearson. The Olympic silver medallist from Beijing, who entered the year with a personal best of 12.50 seconds, was completely dominant in the 100 metres hurdles, an event that was up until recently considered to be one of the most competitive in all of world athletics. She ended the season with 8 of the fastest 13 times for the event, and ran sub 12.60 seconds on a staggering 9 occasions. However, it was her performances at the Daegu World Championships that really made the athletics and general sporting world take notice. After winning her heat in a world class 12.53 seconds, she recorded a new Australian record of 12.36 in the semi-final the next day. Just a couple of hours later she went better again, claiming the gold medal in 12.28 seconds, the 4th fastest performance in history, the quickest women’s sprint hurdles clocking since 1992, and without saying too much, a world record in the eyes of many people. So dominant was this victory, that the silver and bronze medallists, Danielle Carruthers and Dawn Harper, despite both running lifetime bests of 12.47 seconds, were not even remotely close to the powerful Australian. Had it not been for a fall (when leading comfortably) in her last race of the season in Brussels, Pearson would have finished 2011 undefeated, and she deservedly was presented with the IAAF World Athlete of the Year. She has now very much broken into the consciousness of the mainstream public in Australia, a market saturated with many different sports, and there will be huge expectation for her to claim Olympic gold in London next year. Few would bet against her at this moment in time. This was Part 2 of James’ review of 2011. Read here for Part 1 and here for Part 3.